Bathroom There are 90 products. 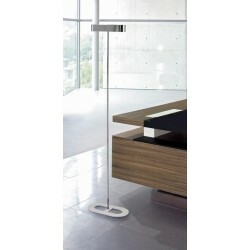 Led Floor Lamp in bi-emission with diffuser in extra clear frosted glass. Metal frame. Chrome color. Lighting: 2 100W E27 bulbs (not included). Included with the purchase 2 low-energy Fluorescent Bulbs E27 (Energy Saving). Also available with LED lighting SMD multi-chip natural white light. Table Lamp in bi-emission with diffuser in extra clear frosted glass. Metal frame. Chrome color. Lighting: 2 E27 60W bulbs (not included). Included with the purchase 2 low-energy Fluorescent Bulbs E27 (Energy Saving). 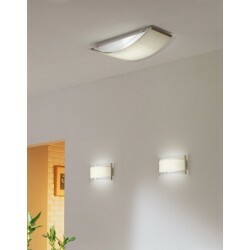 Also available with LED lighting SMD multi-chip natural white light. Lamp giving diffused lights. Etched opal blown glass diffuser, frame made of chromiumplated metal. Also available with multi-chip SMD LED natural white light. Included with the purchase a low-energy Fluorescent Bulb E27(Energy Saving). Table Lamp providing diffused light. Painted metal structure, chrome glass holder. 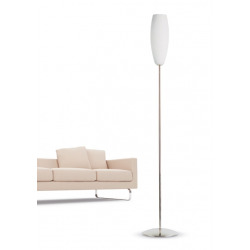 The conical shaped diffuser is made of glass, available in white satin, damask white or decorated with gold leaf. Included with the purchase 1 Bulb E27 low consumption (Energy Saving). 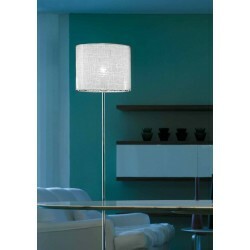 Also available with LED lighting SMD multi-chip natural white light. Lamp for diffused light. 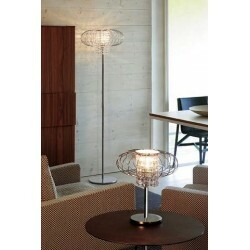 Structure in chromed metal, diffuser in blown glass. Included with the purchase 1 Fluorescent Bulb E27 fuel-efficient (Energy Saving). Suitable equipment for LED lamps. 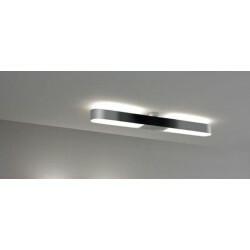 Led Ceiling Lamp in bi-emission with diffuser in extra clear frosted glass. metal frame. 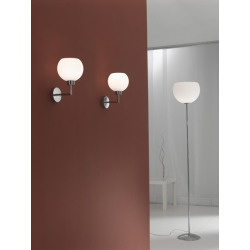 Lighting: 2 lamps 18W 2G11 (not supplied). Also available with LED lighting SMD multi-chip natural white light. Floor Lamp with diffused light. Chromed metal, diffuser in blown glass. Included with the purchase of 1,2 or 3 E27 Bulbs (Energy Saving). SUITABLE FOR THE INSTALLATION OF MODERN BULBS LED. 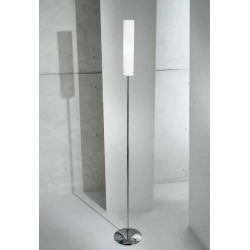 Led Table or Floor Lamp with diffused light. Structure consists chromed metal arches that enclose a diffuser in crystal 30% PbO faceted. Color Chrome. Lighting (Table): 1 G9 48W bulb (not supplied). Lighting (Floor): 1 bulb E27 105W (not supplied). Included with the purchase a low-energy Fluorescent Bulb E27 (Energy Saving). 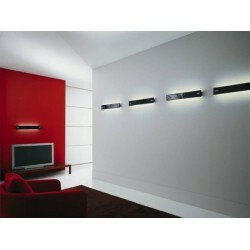 Led Wall Lamp in dual-emission with diffuser in extra clear frosted glass. metal frame. Lighting (330mm): 2 light bulbs E27 60W (not supplied). Included with the purchase a low-energy Fluorescent Bulb E27 (Energy Saving). Lighting (840mm): 2G11 2 24W bulbs (not supplied). 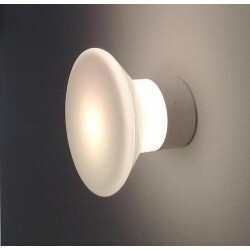 Also available with LED lighting SMD multi-chip natural white light. Ceiling lamp with diffused light. Metal frame finished in satin nickel. 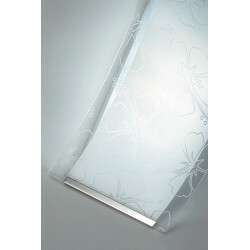 Diffuser in extra-clear screen-printed satin glass. 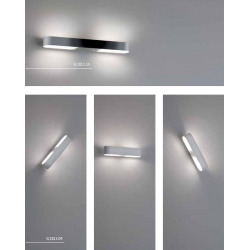 Also available with LED lighting SMD multi-chip natural white light. 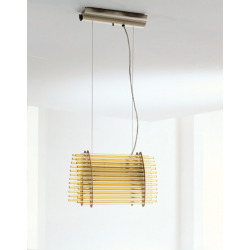 Pendant Lamp giving diffused light. 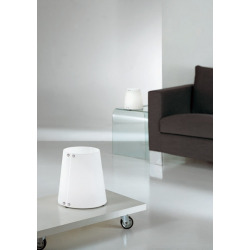 The diffuser is characterized by a sequence of alternating canes in Murano glass, color Blue or amber and white. Structure in brushed nickel metal. The play of light rays makes this collection unique in its kind. Design by Christian Pavanello. 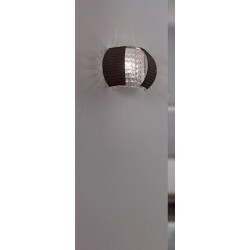 Wall Lamp with diffused light and chromed metal frame. Pongè diffuser and faceted crystals 30% PbO. Lighting: 1 light bulb E27 52W (not supplied). Included with the purchase a low-energy Fluorescent Bulb E27 (Energy Saving). Also available with LED lighting SMD multi-chip natural white light. Ceiling Lamp with diffused light. Painted metal structure, glass diffuser blown opal satin. 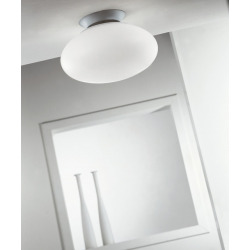 Also available with LED lighting SMD multi-chip natural white light. Suitable equipment for LED lamps. Lamp giving reflected light. 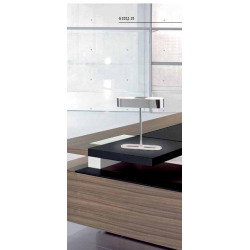 The diffuser is in handmade glass, structure metal and details in brushed nickel. Available in Black and White finishes. 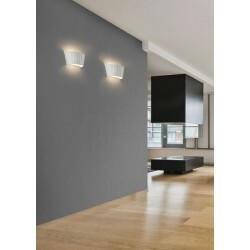 Also available with LED lighting SMD multi-chip natural white light. 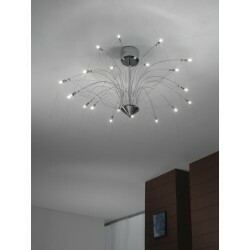 Ceiling Lamp featuring a metal frame with chrome finish. Lighting: 30 G4 10W bulbs (not supplied). Suitable for the assembly of modern LED bulbs.